Amino acids are the building blocks of protein. In fact, the daily protein requirement is really the body’s need for amino acids. Dietary amino acids are classified as essential and non-essential. Both are used to assemble hormones, enzymes neurotransmitters (chemical messengers), antibodies, and nutrient carriers. 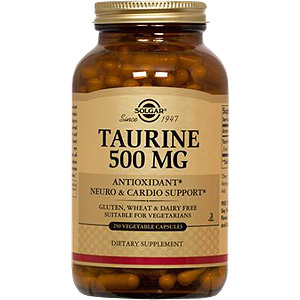 Taurine, one of the most abundant amino acids in the body, is a simple, sulfer-containing compound. It plays a variety of roles in helping the normal function of the brain, eyes, heart, and vascular system. Although it is abundant in the body, it is not incorporated into protein. It is found as a free amino acid in activity, helps to enhance cardiac contractility, stabilizes eye membranes, and helps to enhance sperm motility. Solgar's Taurine Vegetable Capsules are free of corn, yeast, wheat, soy and dairy products and are formulated without the use of preservatives, artificial flavors or colors. As a dietary supplement for adults, one (1) vegetable capsule daily with juice or water, between meals, or as directed by a healthcare practitioner. Long chains of molecularly bonded individual amino acids form protein. The body must first break these molecular (peptide) bonds for amino acid absorption to take place. Solgar's free form amino acids are already in their simplest form (no peptide bonds) and can be readily absorbed into the bloodstream. Other Ingredients: Vegetable Cellulose, Microcrystalline Cellulose, Vegetable Stearic Acid, Water. May contain vegetable glycerin. 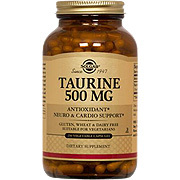 Taurine 500 mg is shipped in a discrete, unmarked package. Orders are processed immediately and usually take about 3 to 5 working days to be received. We do ask that you try it for 2 to 3 weeks to feel the full effects. Any information received is used only for order processing and shipping purposes. Your information, such as e-mail address, will never be disclosed to a third party.